Workers’ Activism Rises as China’s Economy Slows. Xi Aims to Rein Them In. BEIJING — Factory workers across China are staging sit-ins demanding unpaid wages for “blood and sweat.” Taxi drivers are surrounding government offices to call for better treatment. Construction workers are threatening to jump from buildings if they don’t get paid. With economic growth in China weakening to its slowest pace in nearly three decades, thousands of Chinese workers are holding small-scale protests and strikes to fight efforts by businesses to withhold compensation and cut hours. The authorities have responded with a sustained campaign to rein in the protests, and most recently detained several prominent activists in the southern city of Shenzhen late last month. Such protests are a glaring example of the challenges the sharp economic slowdown poses to China’s top leader, Xi Jinping, who has aggressively promoted the “Chinese dream,” his signature vision of greater wealth and a fairer society. Workers protested over unpaid wages at a construction site in Anhui Province this month. As Chinese families gather this week to celebrate the Lunar New Year, the most important holiday of the year in China, many workers say they are struggling to pay basic expenses like food and rent. “Nobody cares about us anymore,” said Zhou Liang, 46, who took part in a protest last month in Shenzhen outside an electronics factory that he says owes him more than $3,000. China Labour Bulletin, an advocacy group in Hong Kong that tracks protests, recorded at least 1,700 labor disputes last year, up from about 1,200 the year before. Those figures represent only a fraction of disputes across China, since many conflicts go unreported and Mr. Xi has intensified censorship. The authorities have detained more than 150 people since August, a sharp increase from previous years, including teachers, taxi drivers, construction workers and leftist students leading a campaign against factory abuses. The unrest puts the ruling Communist Party in an uncomfortable position. Since the days of Mao Zedong, the party has staked its reputation on protecting everyday workers, but increasingly many are blaming party officials for not doing more to defend their rights. 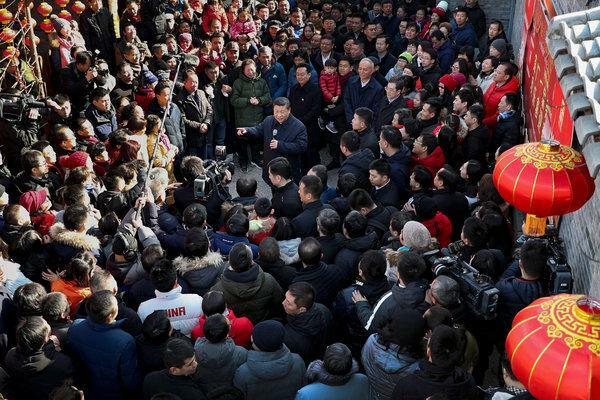 As protests have multiplied, Mr. Xi, China’s most powerful leader since Mao, has sought to reassure workers that he understands their plight. But experts warn that public trust in the party and Mr. Xi’s “Chinese dream” could suffer if he does not do more to help workers. “If teachers refuse to work, truck drivers stop delivering goods, construction workers stop building infrastructure, it will be hard to chase dreams,” said Diana Fu, an assistant professor of Asian politics at the University of Toronto. The unrest has also affected newer industries, including companies that provide food delivery and ride-sharing services, as workers complain of backbreaking schedules and low pay. Mr. Xi, who rose to power in 2012, faces a variety of headwinds that are complicating his efforts to manage a smooth transition to a high-tech economy. Consumer and business confidence is falling, the housing market is sputtering and a trade dispute with the United States is dragging on. The government says the economy grew by 6.6 percent last year, the weakest pace of growth since 1990. Many experts, noting problems like declining property sales and sluggish factory activity, say the actual rate may be even lower. As economic forecasts have turned more sober, Mr. Xi has sought to defuse tensions by urging companies to pay salaries for low-income workers on time. The State Council, China’s cabinet, says it wants to eliminate wage arrears by next year. Labor protests in China are common, and to avoid protracted conflicts, local officials often put pressure on businesses to settle disputes. But companies may be more unwilling — or unable — to do so now as they struggle to find money. Mr. Xi has expanded the party’s oversight of the All-China Federation of Trade Unions, the party-controlled organ that is supposed to mediate disputes for its more than 300 million members but often sides with management. He has also dismantled nonprofit labor advocacy groups, which in the past provided advice to workers and helped with collective bargaining. In a crackdown in Shenzhen in late January, the authorities detained five veteran labor rights advocates and accused them of “disturbing public order,” a vague charge the party often uses against its critics. Now, with no independent unions, courts or news outlets to turn to, some workers are resorting to extreme measures to settle disputes. Wang Xiao, 33, a construction worker, grew tired of lobbying his bosses for more than $2,000 in unpaid wages for a project in the eastern province of Shandong. So last week he turned to social media, threatening to jump off the headquarters of the company overseeing the project. Despite the restrictions, activists have had some success in organizing protests across provincial lines, often with the help of social media. Crane operators across China coordinated a Labor Day strike last year that involved tens of thousands of workers from at least 10 provinces. But at a time of economic uncertainty and rising tensions with the West, Mr. Xi has emphasized social stability above all else. At a meeting on “risk prevention” last month, he called on provincial leaders and senior officials to redouble efforts to expand ideological and social control. Chinese leaders see labor unrest as a potential political threat and are particularly sensitive to demonstrations because this year is the 30th anniversary of the military crackdown on pro-democracy protesters on Tiananmen Square. Mr. Xi has particularly sought to suppress a resurgence of labor activism on college campuses, including a high-profile campaign for workers’ rights led by young communists at elite universities. The activists have used the teachings of Mao and Marx to argue that China’s embrace of capitalism has exploited workers. Last summer, they tried to help workers in southern China organize an independent labor union, saying that corrupt local officials were colluding with managers to abuse workers. The authorities have repeatedly tried to quash the protests, leading to the disappearances and detentions of more than 50 people associated with the campaign. The authorities have responded so forcefully to the young communists in part because their demands are ideological, not material, said Professor Fu, who has studied unrest in China. But most workers are less focused on challenging the party than they are on trying to make ends meet. Song Zuhe, 50, who packages ceramic tile at a ceramic tile factory in southern China, says he is owed $1,500 in back pay and has not received a paycheck in three months. My life as a laborer is bitter. This year, when Mr. Song returned to his hometown in southwestern China to celebrate Lunar New Year with his family, they sat down to a small dinner of chicken and vegetables.